Julie is native of Northwest Iowa, growing up in Hull, IA and attending Boyden-Hull High School. She graduated from Northwestern College and went on to receive her Master’s of Physical Therapy degree from the University of Des Moines. She has been a licensed physical therapist since 1996. 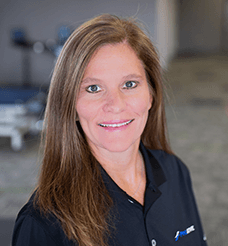 Julie has a strong educational background in manual therapy utilized in treating spinal and musculoskeletal injuries, pain or problems. Julie is an active member in her community, sitting on different boards including Board President of Family Crisis Center. She is also a member of the American Physical Therapy Association and Private Practice Section. Julie and her husband, Todd, live in Sioux Center with their three kids. I am excited to work alongside a team of great providers who are passionate about what they do and the people they serve. I enjoy the opportunity to help people restore strength, range of motion, function and their overall quality of life. Seeing current and former patients active again in the community or in athletics is why I go to work each day. My hope is that every patient that walks out our doors feels valued, heard, and that they were given the best care possible. I want them to feel like their health was invested in and that they leave here better than when they came. Outside the clinic, I enjoy spending time with my family, attending my kids’ activities including many sporting events, as well as traveling.